A Great Pondhawk, photographed and posted to the Arlington Bioblitz and iNaturalist by David Howell. As the information as posted is crowd sourced and open for people to help identify and confirm observations, it can sometimes take a while to get all the results back. While bioblitzes always provide good information and data, this last one provided a bit more of a last surprise. After one of the photo observations made by David Howell which he posted on iNaturalist started making the rounds, several people noticed what they thought was something quite interesting. 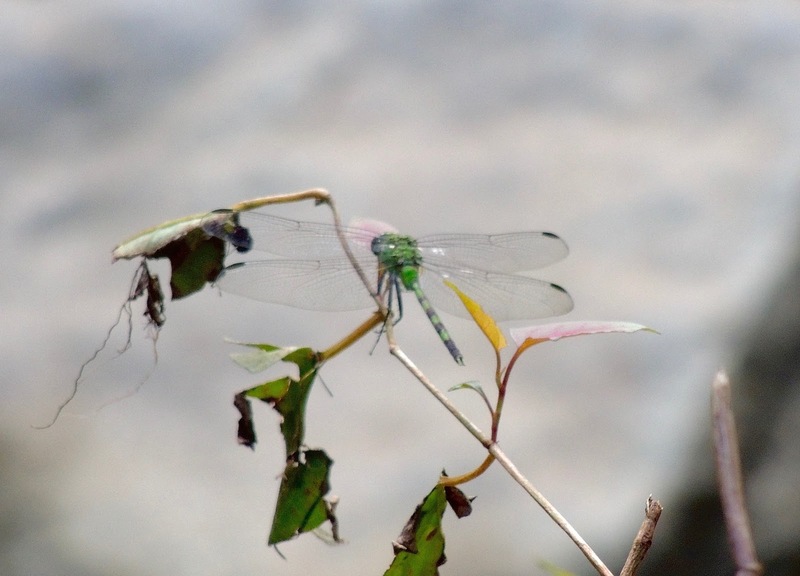 The photo was sent to several experts and dragonfly discussion groups and the consensus was that what had been photographed was a Great Pondhawk Dragonfly (Erythemis vesiculosa). This appears to be a new state record for this mostly tropical dragonfly. While it is a very large and powerful flying dragonfly, it rarely strays North of Florida in the East, with the only previous record I could find of the next northernmost record being of one being near Savanah, Georgia back on September 18th of 2013 (interestingly 3 days and 4 years earlier). In fact, while it's been known to go as far north as Kansas in the West, it is never common anywhere in the USA. The Great Pondhawk, as its name suggests is a large and powerful dragonfly, often eating other large insects including other dragonflies. It is not uncommon in Mexico and has a range into South America as far as Argentina. It is such a strong flyer that it often ends up on Caribbean islands, even being featured on a few island's postage stamps. But it rarely strays north in the East, even in Florida. Another instance of effects of global climate change? What's next!? hi, thanks for share this post. this very helpful post.